I hear from a lot of HSPs who write in to ask if their sensitive parent / friend / partner who is clearly really sensitive but who gets offended easily, is not open to other people’s point of view and demonstrates little to no empathy, is just a Highly Sensitive Person but doesn’t know it? When we are actively looking for something, we tend to be sure that it is in places where it actually isn’t. That’s because, on some level, we want it to be there. The same goes for High Sensitivity. If you’re relatively new to the concept, and you’re just starting to connect the dots on it in your own life, you suddenly start wondering: wait, maybe that person is HSP too! It’s a perfectly fine thing to ask. Yet, here’s the rub: it also becomes a way to “explain away” troublesome behaviour. When someone over-reacts, gets offended easily, attacks you over the smallest thing, feels entitled to special behaviour, maybe they are just a traumatised and misunderstood HSP! 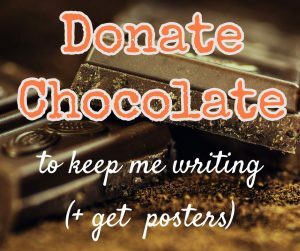 Since you are – in actuality – uncovering your own (minor or major) traumas and starting to understand that being a misunderstood HSP for so long is painful… you start to project that dilemma onto other people around you. Maybe they are struggling with that exact same problem too! 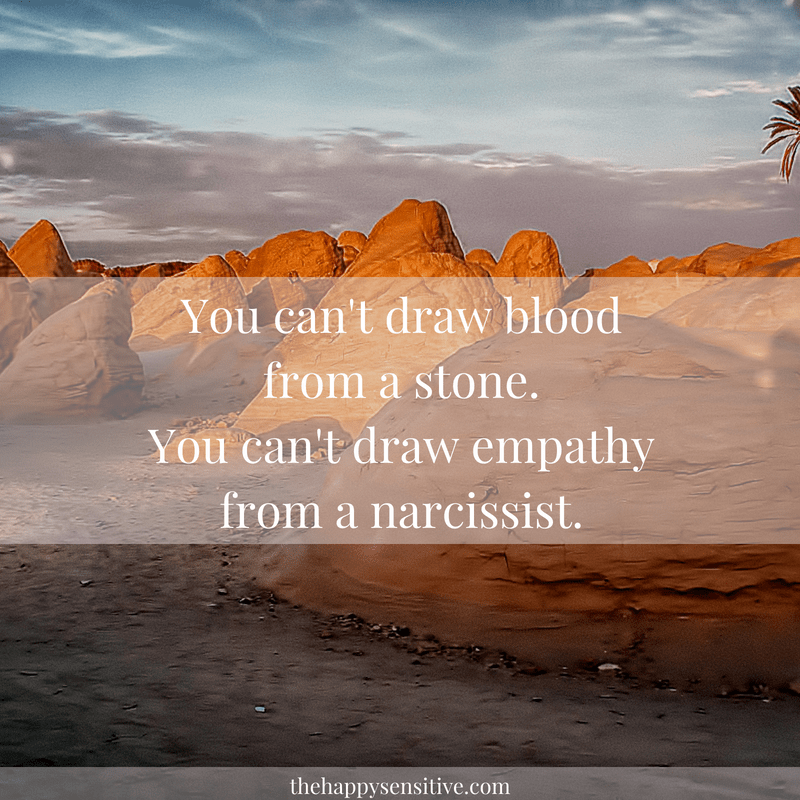 Sensitivity – Empathy = Narcissism. To this, someone could say: hold on a minute! But what if this person lacks empathy because they are traumatised! It’s not their fault! They are just an HSP with a very big shell to protect their sensitive insides. Sure. You’re still describing narcissism though. We all can get self-absorbed and uncaring at times, especially when we are stressed. The question is, is it the exception or the rule? When it’s the exception, you can see afterwards how you hurt someone’s feelings, you can apologize, you can make an effort to do better next time you feel upset. However, when narcissism becomes the rule, then that introspection and willingness to change vanishes into thin air. Those tiny windows of empathy become so tiny, and so sporadic, that they offer no hope for true introspection and change. In the best scenario, someone who is “stuck” like this gets kicked off their high horse by a tragedy or illness that forces them to be humble, ask for help, and discover they don’t have all the answers. Until, that time, good luck. When narcissism becomes the rule, someone’s occasional windows of empathy become so tiny, and so sporadic, that they offer no hope for true introspection and change. Ever heard of confirmation bias? When someone is really entrenched in a certain position, they only absorb the info that confirms what they already believe. You can give them the most insightful books in the world and they won’t actually learn anything from them. They might however use that information to judge you with (because that’s something they’re already proficient at). When trying to figure out if someone is a Highly Sensitive Person, once you’ve assessed the sensitivity, also take an honest look at their empathy levels. When someone’s empathy levels are low to non-existent, don’t make the mistake of assuming that they are just a “traumatised HSP” that you can help or educate. I get that when something hurts in relationships that are important to you, you want to fix it. You want to give it your all. It’s a good trait to want to put in the work. However, if the only way things can truly get better is for the other person to change then be careful, because you’re on very thin ice. The more narcissistic someone is, the less reason they will see for why they would need to change. In their eyes, the world is the problem, not them! Trying to fix the situation can keep you from looking at yourself: what do you need from this relationship? What are you not getting? Is there -realistic- hope for improvement, or do you keep hurting yourself by trying endlessly? You can’t draw blood from a stone. 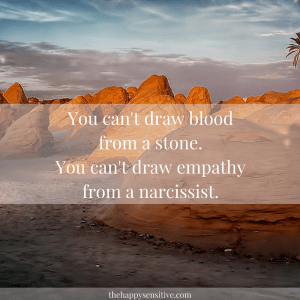 You can’t draw empathy from a narcissist. Narcissism is more accurately a scale, a percentage. So rather than trying to figure out if someone is one or not, it’s more useful to see how open-minded, self-reflective and empathic they are overall. Then etch those percentage numbers into your brain and don’t try to change them. Rather, assess what is and isn’t possible within those restraints.